Hermetic room by JOIX The Hermetic Room LP is out! What you definitely should not miss is the Hermetic Room Player, a unique Web player to enjoy the album with self made animations. If you like to support me, just order a vinyl of the album or buy the digital release at Bandcamp. Many thanks to Philipp aka "Halt-9000" for the artwork and to Josh for his help with the album text. 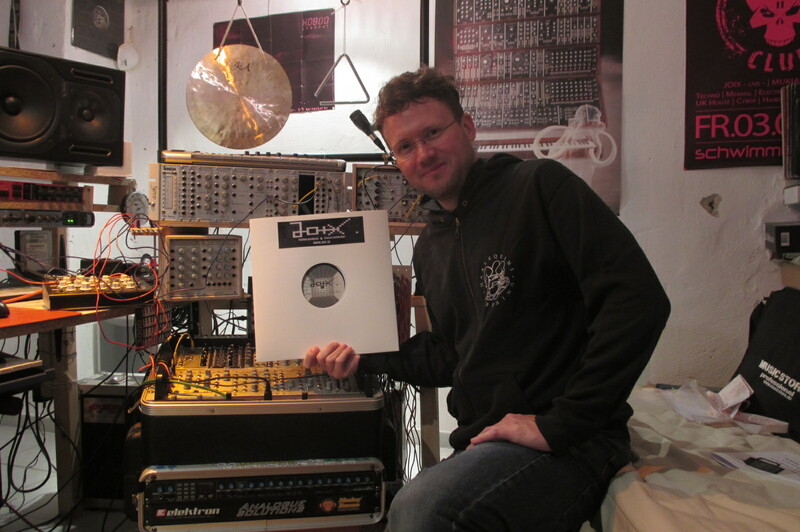 Die Hermetic Room LP ist da! Auf keinen Fall verpassen solltest Du den Hermetic Room Player, ein selbstentwickelter Web-Player, bei dem das Album mit Echtzeitanimationen visualisiert wird. Wenn Du mich unterstützen möchtest, bestelle einfach eine Platte oder kaufe das digitale Release auf Bandcamp. Mein besonderer Dank geht an Philipp aka "Halt-9000" für das Artwork und Josh für die Hilfe beim Album-Text. 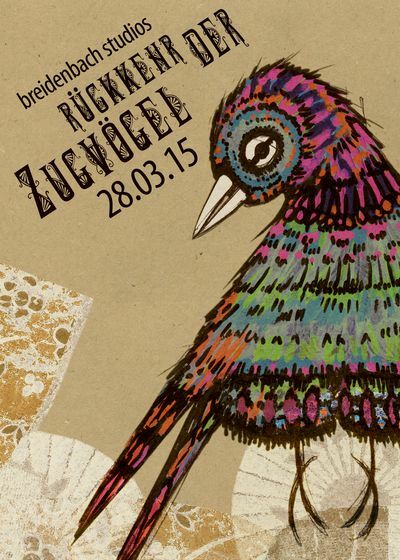 Und nicht vergessen: Am Samstag findet die Release-Party in der Mohawk Bar in Mannheim statt! I'm very happy to anounce my upcoming Album Hermetic room yet! Official release date is the first of June 2015, the LP vinyl is still in production! If you are in the near, dont miss the Album Release party at Mohawk Bar on 6th June in Mannheim! Nach einem halben Jahr ohne Auftritte schwinge ich endlich wieder meine Liveact-Flügel an diesem Samstag in den Breidenbach Studios simultan zur Rückkehr der Zugvögel. Da sich in meiner Winterpause einiges an neuem musikalischen Material angesammelt hat, bin ich schon gespannt auf den Jungfernflug dieser neuen Tracks. Meine Flugzeit ist von 24-1 Uhr im Keller. For some of my friends its not a secret any more, but I am currently working hard on my second album, which should be released in a few months! For shortening your waiting time here is a snippet of a brandnew track called "Kybalion". Preview of new track "Back and forth" with some polymetric beat structure. New track with self-made field recordings of the Tokyo subway during my visit of Japan in August 2014. For free download! Feel free to share! Arigatou gozaimasu! Complete record of my live performance at About, Nagoya as part of my JAPAN TOUR 2014 (more records of this amazing tour you can find here!). Zum Ausklang des Sommers habe ich noch die Freude auf zwei schönen Festivals aufzutreten, am 6. September beim Schweinskopf Festival in der Nähe von Cuxhaven und am 21. September beim Mohawk Open Air in Mannheim. Little video with some impressions of my live performance at Metro Club, Kyoto, Japan on 9th August 2014. I will play at 4 clubs in 4 different cities: Osaka, Kyoto, Nagoya and Tokyo from 7th to 25th August. Record of my liveact @ "Harlequins Zauberberg Chapter IV", Berghotel Königsstuhl, Heidelberg on 5th July 2014. Some nice photos of this live performance you can find on my facebook fanpage. Secret Cult EP is out! Released by Lethal Dose Recordings today. Available at Beatport. It includes the three tracks Secret Cult, Fallow land and Amorphous fields, which are characterised by a powerful broken kick drum and attention to detail. NEW Track: "Corridor". Many thanks to Basill for the nice artwork! 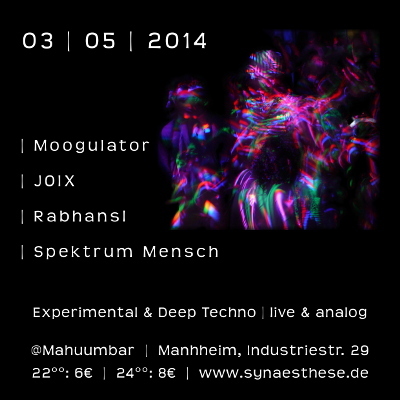 3rd May I will be on stage again at Synästhese#2 with Moogulator & mates! Here is a preview of "Prayers walk", a new Deep Techno track by me, composed with handmade Synthesizer,- Didgeridoo- and Gong-Sounds. Here's a complete video record of my live performance at the event "Synästhese" a few days ago! Enjoy watching this piece of art and feel free to share it in social networks! Thanks for your support! See you on the dark dancefloor next time! Exactly two years ago my dark debut album "Random Control" came out. From today you can download it here for free! Don't miss: On 29. 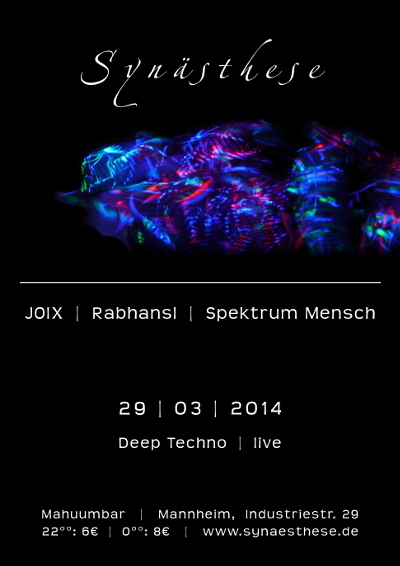 March I will play my next Liveact at Synästhese in Mannheim! Celebrating the Chinese New year with this new Deep Techno track: "Snakes & horses". New Deep Techno track: "Nightfall". Back to 4/4 with this floating track: "Afterglow".